The Navy temporarily lost communication with a submarine off Florida's coast and sent ships and aircraft to search for the USS San Juan before the vessel was contacted early Wednesday, military officials said. There were no problems with the Los Angeles-class sub, based in Groton, Conn., and the Navy is investigating the incident, the Naval Submarine Force said in a statement. A carrier battle group was operating with three submarines 100 miles off the coast of Florida when a lookout reported spotting a red flare — the traditional signal for a sub in distress, reports CBS News national security correspondent David Martin. The battle group immediately tried to establish communications with all three subs. Two answered, but the USS San Juan, which was playing the role of an enemy submarine as part of the exercise, remained silent. At 3:30 Wednesday morning, Martin reports that the submarine center in Norfolk, Va., sent out the rarest and most critical of messages: "Sub Sunk." It has been nearly 40 years since the Navy lost a sub — the USS Scorpion, which went down with all hands in 1968. Defense Secretary Robert Gates was awakened in the early morning hours and told of the events, Pentagon spokesman Bryan Whitman said. 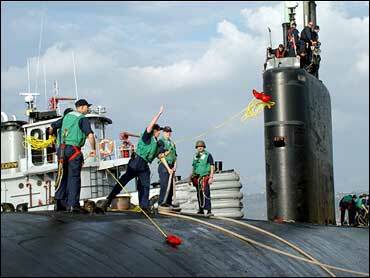 "The secretary of defense was notified at the time when the Navy felt that they had a sub in distress," he said. The Navy immediately started searching and also contacted the International Submarine Escape and Rescue Liaison Office in Norfolk to assist with the efforts. Family members of those on board also were notified. "Fortunately, the submarine established communications in the early morning hours ... and indicated that there were no problems; hence, units were able to stand down from the search and rescue that was already well under way," the Navy said in a release. There were about 140 sailors on board, said Lt. Mark Jones, a Navy spokesman in Groton.